AmeriCorps. Have you heard of it? 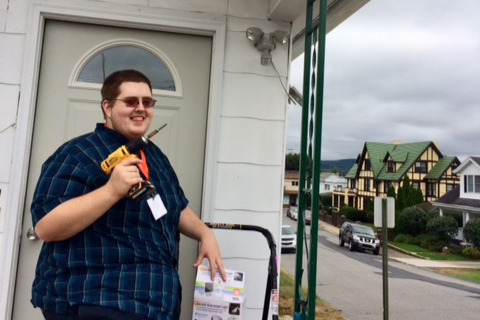 It’s been six months since I started my AmeriCorps VISTA service at NeighborWorks and, to be honest, when I started my service I had no idea what AmeriCorps was either. After my first interview for the position, I spent many hours reading online, asking friends, and digging for information about both organizations. Even after my training in Columbus, Ohio, where they talked a lot about the mission and the purpose behind the service, I wasn’t certain what I was in for. Nothing could have surprised me more than how smooth everything was in the beginning. I learned a lot in the first few weeks of my service and I can see now how much I have grown as a professional since those early days. As the weeks melted into months, I got the chance to work on larger projects and found a rhythm in the organization that helped me find my feet. My first big challenge of my service term was leading several volunteer groups on projects helping older homeowners. The events themselves went off without a hitch, but there was a lot of work behind the scenes that made me appreciate much more all that goes into these types of events. I have now helped with many of these events, and watching the volunteer group go from wall flowers to having a real connection with whoever we are helping is my favorite part. Along with working on volunteer projects, I also got the chance to build a program from the ground up. The Beautiful Blocks program was not even on the radar when I started my service, but in November the chance materialized. To do all the work to start this program and to see the positive reaction it has been receiving over the last few moments has been exciting. This program will do a lot of good and I’m very happy to have been a part of making it a reality. Often people say that you have to wear a lot of hats at a nonprofit. Well, in my experience that is definitely true. Having the chance to lead volunteer groups, build programs such as Beautiful Blocks, and work with community members has made my days interesting. There were many challenges along the way and, through tackling those challenges, I grew a lot as a professional. Not every day was a cake walk, but every day did allow me the chance to try new things that I never would have before. More than anything else, that is what makes AmeriCorps service special. It gives people like me the chance to apply their skills and grow, but at the same time have a real lasting impact on the organization, community, and people they interact with.